Welcome to Marvel Strike Force Guides page. This is the full description of MSF Blitz segment with all information regarding it. Hello everyone! 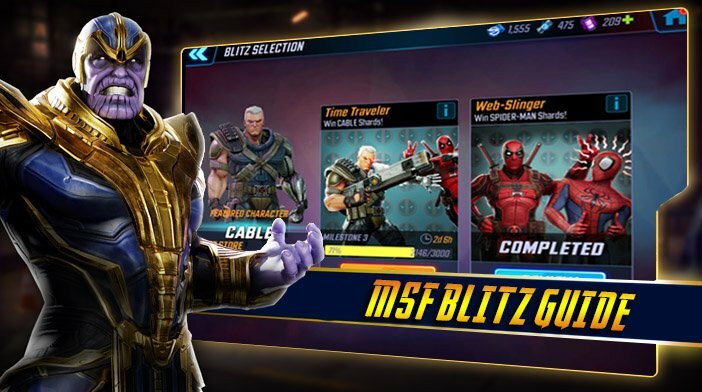 We will talk about one of the most interesting segments of Marvel Strike Force – Blitz. Blitz is part of Marvel Strike Force where you fight a great number of battles with the different teams in the attempt to earn as much blitz points as you can. We can characterize Blitz as PvP because you fight against other players Blitz teams but the main difference between Blitz and Arena, except rewards, is that in Blitz you get Blitz points for win instead higher ranking. Blitz events occur few times in the week and usual duration is one, two or three days depending on the event. So basically we have three blitz events per week (sometimes we have 2 three days blitz and 1 one day blitz, and sometimes we have 2 two days blitz and 1 three days blitz). In order to fight blitz battle, you need blitz energy and every hero has his own blitz energy ready to be spent which means that if you use 5 heroes in 1 team other heroes in your roster can be used in other teams regardless of their power and role. Blitz energy for all your heroes refills every 6 hours and when it's used that not necessarily end your journey in blitz because you can use blitz charges instead of blitz energy for next fights. First three battles with blitz charges cost 5 blitz charges per hero (totally 25 per team) second three battles cost 10 charges per hero (totally 50 per team), third three battles cost 20 blitz charges per hero (totally 100 per team), etc. Blitz charges can be obtained through GAME MILESTONES (not blitz milestones), Medical Supply Run CHALLENGES which are available on Mondays, Thursdays and Sundays, and through DAILY OBJECTIVES rewards. Of course, when you run out of blitz charges you can always use power cores. As we can see there are 3 kinds of rewards for Orb Assault Blitz Event. Premium Orb fragments are needed for opening Premium Orbs, Blitz Credits can be used for purchasing in Blitz Store, and Blitz Orb Fragments are used for opening Blitz orbs which contain shards of Marvel Strike Force characters. In other Blitz Events, rewards are totally different and depend on the Blitz type. Beside Orb Assault Blitz there are also Red Stars Orb Blitz and Hero (different Hero every week) Blitz. After a few weeks of playing, you will be familiarized with Blitz rewards and you will know what to expect from each Blitz. So basically, for completing milestones we get the same type of rewards as we get for total ranking (in a smaller amount of course) plus we get gold and Basic Orb fragments. My advice is that for blitz you have as many different teams as possible because more teams mean more free fights and more points. You should build your teams around 1 protector and 1 controller if possible, and you should try to bind heroes with similar power in the same team. After Milestone 7 and multiplayer tier 8, serious problem begins and you will have to fight teams that are much stronger than you. A good thing is that you can choose 1 of 3 enemy teams which you will fight and in the most of cases you will always find 1 team you can beat if you have good team composition because the A.I. is limited. For example, my team made of Captain America, Crossbones, Gamora, Yondu and Quake with the power of 96600 easily won gainst Crossbones, Hulk, Daredevil, Wolverine, and Gamora with the power of 124200. When you chose which enemy team you should fight always look for teams without protectors or with just 1 protector and don’t be afraid of enemy controllers because computer A.I. doesn’t use their skills properly. I hope that this little guide helped you to fully understand all aspects of the blitz segment in Marvel Strike Force. I am looking forward to our next meeting in Arena Guide. We hope that you enjoyed the description of MSF Blitz segment. For detailed information about other MSF Segments check our MSF Guide page.